Sounds about right. 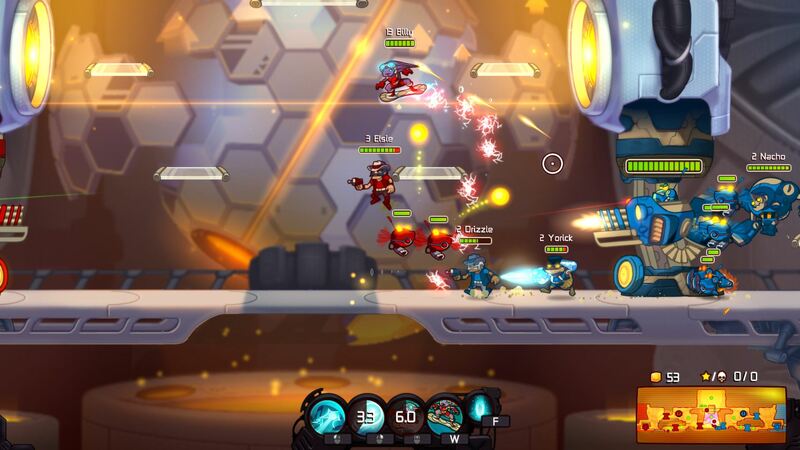 Since Awesomenauts is a multiplayer-focused title, frequent updates are to be expected as players uncover exploits and other nasties, and at the time of writing, no less than 23 patches have been released (wow). These range from minor bugfixes and balance tweaks to sizeable content additions that expand the roster. Romino Games clearly know what ‘post-launch support’ means.. So if duking it out in 3v3 battles where strategy and platforming plays a noticeably larger role than in your average Call of Duty match is your thing, I’d highly recommend Awesomenauts. And with the recent Mac release, it’s now available on just about any platform imagineable, rendering the “I don’t have a this or that so I can’t play it” excuse invalid. These are your choices: XBOX 360 (XBLA), Playstation 3 (PSN) and PC/Mac (Steam). For more details, check out http://www.awesomenauts.com.